Whether you’re a sole or tandem kayaker, it can truly change your experience to purchase the right kayak cart. With the best kayak carts, you simply strap them under the boat and allow the cart to do most of the work. With the wheels to roll and support the kayak’s weight, you can easily get your kayak from your car to the water, and vice versa. The purpose behind a kayak cart is to make transportation of your kayak easier than you having to lug it around with you – which can be especially tiresome after a lengthy kayak expedition. So, we’ve compiled a list of the eight best kayak carts currently in the market. Along with that, we’ve also outlined the need-to-know factors before you purchase your cart in our buying guide and FAQ sections. Keep on reading for the eight best kayak carts. Aluminium pipe (20 x2mm) anodized Stainless steel. Decent weight capacity at 165 lbs. If you’re looking for a carrier trolley that is easy to use, assemble and disassemble, then the Bonnlo Kayak Cart Canoe Carrier Trolley is the perfect choice for you. Though it might not have all the bells and whistles that other carts may have, it does give you a generous towing capacity and durable tires. You’ll find that with the 165 lbs. weight capacity, you can haul even your bulkiest kayaks and/or canoes with this. The design of this cart means that it’s very easy to put together, and just as easy to disassemble for easy storage. The 10-inch spring loaded, built-in stand ensures that you have stability as you stop. The tires further help the stability and durability as they are made entirely of rubber which helps them glide easily even over uneven terrain. This TMS Deluxe Boat, Kayak, Canoe Carrier has a load capacity of 120 lbs. and dimensions 13 inches x 22 inches x 9.2 inches. 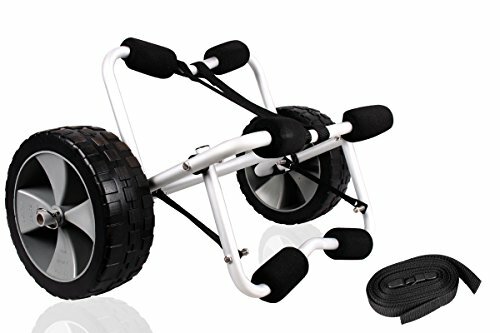 It’s made with two sturdy wheels and constructed with top quality materials. 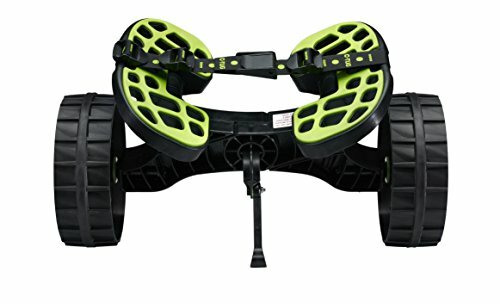 It also features some foam bumpers on the tie down straps and arms, so that you can transport it without worrying about any scratches. 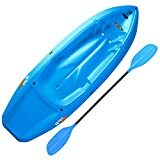 TMS Deluxe Boat, Kayak, Canoe Carrier is said to be able to roll easily through gravel and sand, though some users did find fault in that. To further enhance the durability of this product, it has been constructed with stainless steel and aluminum materials. 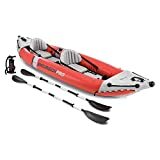 The tires will provide you with stability regardless of what type of terrain you’re on and the stand will help you to quickly load the kayak out of the water. The Kayak, Canoe, Jon Boat Carrier by TMS has the ability to carry up to 150 lbs. worth of equipment at one time. The foam bumpers on each arm of the solid metal frame are designed to protect your boards. The carrier comes complete with a 12 ft. tie-down strap that allows you to securely tie your board to the cart. It also has two sturdy kickstands that ensure easy loading of your board out of the water. The TMS Kayak, Canoe, Jon Boat Carrier features two large tires that are able to cart your boards through various terrains, including gravel and sand. The stand allows you to keep the cart propped up while you load and unload your board. When it’s not being used, the cart can be folded up for easy storage. One of the best features of the C-Tug Kayak and Canoe Cart is its design. 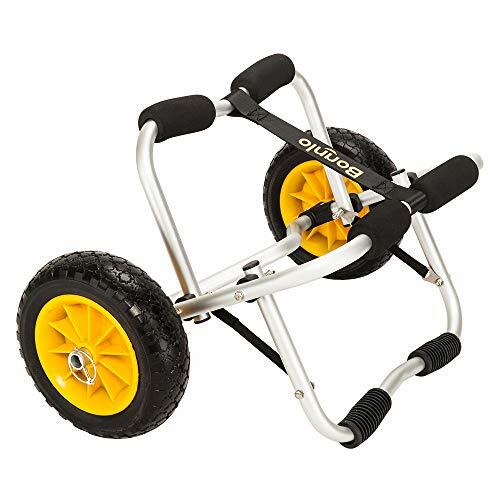 The trolley features rubber made wheels that provide you with a firm grip at all times. It has the ability to load up to 300 lbs. at a time, which is great when you’re hauling around bulkier boards. In addition to the design, the cart is constructed with superior quality stainless steel, to ensure that the product remains corrosion free. 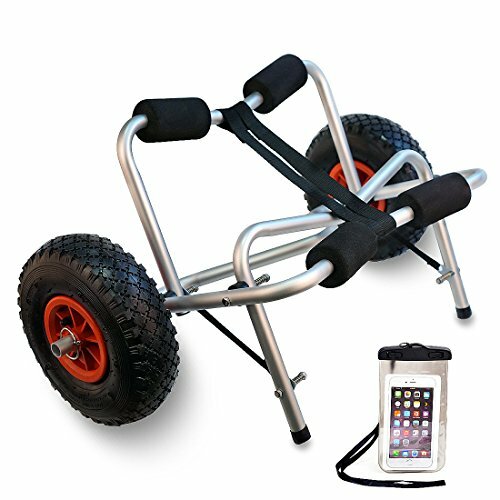 If you don’t consider yourself to be very handy, the C-Tug Kayak and Canoe Cart is the perfect choice for you as it doesn’t require any special tools to assemble. It also breaks down into six parts fairly quickly, which ensures easy storage. It comes with long web straps, which make it easier for you to cart around two boards at once. The Malone Auto Racks Clipper Deluxe Universal Kayak Cart is truly a universal cart. The design ensures that it has the capability of carrying all sorts of kayaks. With its 200 lbs. loading capacity, the cart can easily hold even a heavy tandem kayak. Even with its weight, it still manages to remain stable, especially when you lock the kickstand. Once it’s been set up, the cart will hold its position while you put the kayak on. 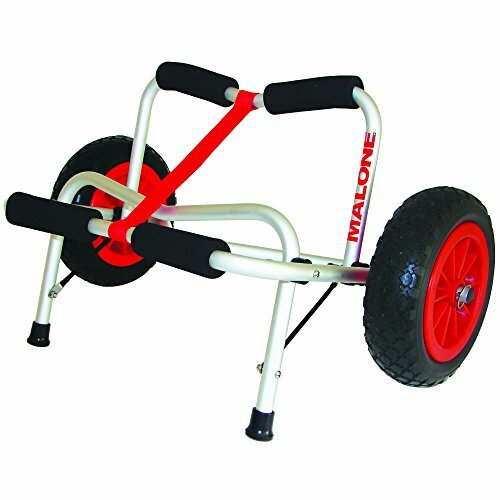 One of the best parts of the Malone Auto Racks Clipper Deluxe Universal Kayak Cart is its airless wheels. These ten-inch wheels provide your cart with enough cushioning to keep it going regardless of what terrain you’re on. When the cart is not being used, the wheels can be removed to allow the cart to fold as flat as possible. If you’re in the market for a quality product that will last you a good amount of time, then the Suspenz Smart Airless DLX Cart is the perfect choice for you. It’s constructed from powder-coated aluminum and stainless steel that help it to resist corrosion and other sorts of damages. 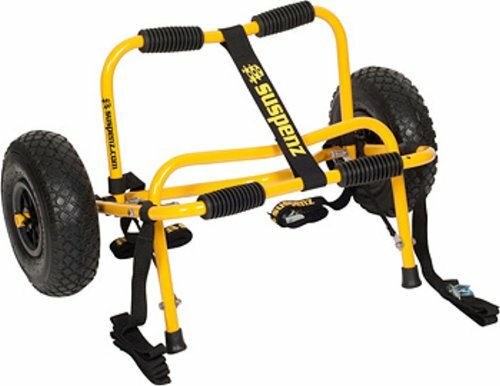 Aside from the durability of this cart, it’s capable of holding a decent amount of weight, at up to 125 lbs. 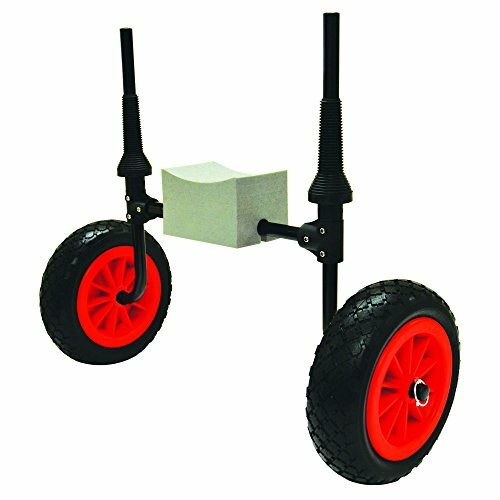 The thing that makes the Suspenz Smart Airless DLX Cart particularly useful is the 10-inch airless tires. These cannot be punctured, so they’re great for pulling over most surfaces, including stones and sharp rocks. Along with durability, the tires help to offer your cart with stability that will avoid the kayak bumping along. For extra precautions, there is padding around the frame of the DLX to prevent any dents or scratches. Though this cart is only suitable for sit on top kayaks, the Malone Auto Racks Scupper Kayak Cart is built on a solid platform with two height adjustable scupper holders on either end. It is one of the best sit on top kayak carts currently in the market. You have the ability to adjust the width from 6.5 inches to 16.5 inches to allow it to work with most sit on top kayaks. The adjustment works with a friction screw, which allows it to be infinitely adjusted. Though the Malone Auto Racks Scupper Kayak Cart features a simplistic design, it can become almost entirely flat once the wheels are removed from the body. If you’re looking for a cart and you currently have a sit on top kayak or a traditional kayak, then this is the perfect option for you. However, you should ensure that your kayak has scupper holes in order for it to be best suited with this cart. TheKayakCart’s 7-Kayak Cart features a flexible cradle which can adapt to the various hull shapes. The cart also comes complete with a hook, buckles, and dual strap attachments. It can hold up to 110 lbs. of cargo and has been designed to be as durable as possible for you. A kayak can be quickly secured to the cart for better and easier transportation. 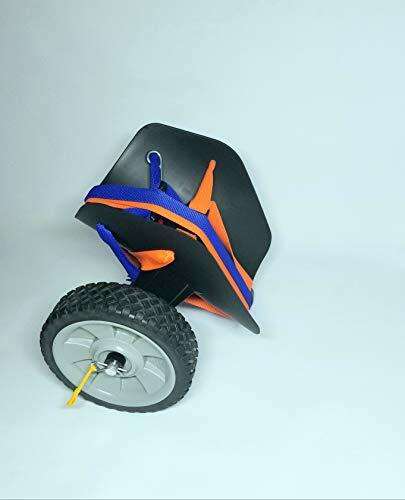 The 7-Kayak Cart features 7-inch copolymer, rubber tread wheels that are best for use on flat terrain. The three optional types of wheels can be purchased separately. The product linked comes with 7-inch wheels. The KC10 model has 10-inch wheels, the KC11 model has 11-inch wheels, and the KC12 model has 12-inch wheels. For soft-sand use, you should look for the 11-inch model. Though kayak carts all serve the same purpose, they are not built equally. We’re going to be going through some of the features that are prone to get overlooked. It’s important for you to go over these considerations before you purchase your kayak cart. There are two main methods of attaching kayaks to the kayak cart. These include the fold out strap version and the scupper drain hole model. These kayaks are able to fold up while they are not in use and be expended when they are needed. In order to keep everything together, you need to use the included ratchet straps or cinch straps. This type of method will fit nearly every kayak model currently in the market. This method will only work for those kayaks that have scupper holes in them. For those that do not know, scupper holes are the holes at the bottom of a kayak that helps to boat to self-drain. If your boat features scupper holes, then you should measure the distance between the two in order to adjust the fit to the drain holes. You should ensure that the frame material of the chosen kayak cart is able to stand up to the normal wear and tear. 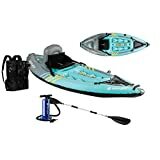 You’ve probably paid a hefty sum of money for the kayak, so why would you want to skimp out on the cart that will be carrying the kayak. It’s best to opt for carts that are made of aluminum, as its more durable than plastic but not as heavy as steel. Generally, there are two routes you can go with the type of tire that you wish to purchase. You can either get a plastic tire or wide, inflatable tires. Though the price difference is minimal, there is a big difference in performance. The plastic wheels tend to be thinner and smaller in diameter. They usually get stuck on everything. If you’re only planning on pulling your cart on harder surfaces, then this will work fine. However, if you use it anywhere else, it will just be annoying. The inflatable, thicker, and larger wheels are able to help your ease in various ways. They roll over objects and bumps with ease and generally do not get stuck on much. The wider profile of this type of wheel is likelier to float better on softer surfaces, such as sand. Many users often wish to purchase ratchet straps for their carts. However, ratchet straps are often best for heavy duty use, such as loading heavy logs or tying down a car. Most of the time, you’re fine using quick straps, as anything heavy is not really necessary with a lightweight cart. Q. What is a kayak cart? Do I need one? A. Kayak carts, or sometimes referred to as kayak trolley’s, are mechanisms that help to transport your large kayaks. They are specifically designed to help you transport your kayak from the sea to your vehicle. Q. Why do I need to find the center of gravity? A. The center of gravity allows you to know where the best place is for your kayak cart to be placed to offer the best support possible. Q. What base material is good for a DIY kayak cart? A. PVC material is possibly the best choice for a kayak cart as it is easy to put together, cheap, and quite durable. With everything said, there are plenty of options available on the market today to meet anyone and everyone’s needs. The products we’ve listed stood above and beyond. With all the information that we’ve provided above, you’ll be ready to make your final decision on which cart is the best purchase for you.